A digital ecosystem usually contains some features: (1) cyclical; (2) sustainable; (3) demand-driven environments oriented around agents that are (4) mutually interdependent in the delivery of value (Heimstädt, 2014). So if open data is an ecosystem, we should be able to identify where the data comes from, how it feeds back to the provider and who are the interdependent agents that drive the demand of open data. 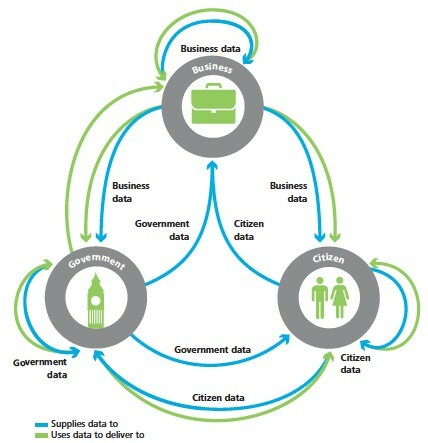 According to the Deloitte report (Deloitte, 2012), government, business and citizens are being identified as the three key constituencies (stakeholders) in a successful open data ecosystem (see Figure 5). Each actor in this space supplies different classes of data to different types of stakeholders. The government publishes so-called open government data, which are data sets “produced, collected or paid for by public money, subject and restrictions related to national security, commercial sensitivity and privacy”. Businesses publish open business data; this data is still freely opened to public, while being subject to specific restrictions that the businesses might decide to put in place. Finally, individual citizens may release personal and non-personal data to the open domain. To further elaborate on the different types of activities undertaken by these three groups we performed a more detailed stakeholder analysis. The stakeholder approach was developed in business sciences as a means to analyse how groups or individuals with vested interests in a firm are or should be considered by its management. The reasons why a company might be interested in such analysis are very diverse, from moral (normative) to efficiency-oriented (instrumental) (Jones & Wicks, 1999). It presents an alternative to the shareholder value model, according to which the managers are only accountable to a firm’s owners. Despite its initial focus on private entities, the approach has been applied to public sector settings (Tennert & Schroeder, 1999), in particular to study technology adoption in this space (see Scholl, 2001), mostly with positive results. Notwithstanding criticism of such an expansion (Donaldson & Preston, 1995), it can be argued that due to outward accountabilities (see e.g., Romzek, 2000), largely constitutive externalities (see e.g., Batley, 1994; Haque, 2001) and the network-type interdependencies of public sector management (see e.g., Kickert, Klijn, & Koppenjan, 1997; O’Toole, 1997), the stakeholder approach seems suitable and beneficial for public sector management (Scholl, 2001; Tennert & Schroeder, 1999). We will hence apply it to understand the open data landscape. Before doing so, we need to consider some of its current limitations. In particular, most applications of the approach to public sector settings largely ignore the question of the reference point. While in an entrepreneurial scenario stakeholders mostly refer to corporations (Donaldson & Preston, 1995), it is harder to delineate to what stakeholders refer to in the public domain. In the main, methods to identify stakeholders start off from an organisation as the reference point (Blair & Whitehead, 1988; Mitchell, Agle, & Wood, 1997). Accordingly, to operationalise the stakeholder approach in the domain of open data, the concept can only be applied to stakeholders to a specific open data project or organisation in charge of open data, not to the abstract concept, or the topic of open data in general. These criteria can be applied to distinguish stakeholders in the open data domain. Thus, stakeholders have the power to substantially influence an open data endeavor by legitimately furthering or diminishing its effort. Accordingly, there is “no […] necessity of reciprocal impact” (Mitchell et al., 1997). Based on the direction of impact and the pertinence of criteria, stakeholders can be classified (Clarkson, 1995; Mitchell et al., 1997). The concept of open data is about making data openly available and accessible. This presupposes that data which meets the criteria to be considered as open is available and provided. Stakeholders who generate and provide open data thus have substantial power, e.g., commanding various means to not disclose data. They often claim high levels of legitimacy by reference to data ownership, their mission or scarce resources. Along the open data life cycle various stakeholders contribute essential input, e.g., strategic guidance, legal counselling, or platform provision. These support units have the power to raise the stakes or ease the process. Often, open data is none of their prime concern, but they provide specific professional expertise, from which they draw significant legitimacy. Especially in the public sector this expertise is often highly regarded (e.g., licensing, liability, privacy, security). A constitutive attribute of open data is the use of the published data by third-parties. Publishing data on the Web is thus not an end in itself. This creates significant dependency on open data users. Considering large troves of published data, incomprehensible to a single citizen, intermediary users, who provide tools to examine, analyse and understand data (e.g., apps), play a special role. Politicians are not involved in the open data life cycle itself, but play a special role in innovation processes in the public sector, where their support is often credited as crucial (Borins, 2002). Besides the considerable power they play in setting the agenda, this role is legitimate in a hierarchical bureaucratic system (Weber, 1958). Furthermore, if selected, politicians draw a large share of legitimacy by their constituency. Advocacy groups are actively involved in setting the agenda for open data projects. Their power base is largely dependent on intermediary sources, since they cannot exert influence themselves. However, they claim considerable legitimacy, tying the topic of open data to larger democratic values of transparency and accountability. In addition, they in part also provide professional expertise in a topic still new to public administrations, giving them the role of a support unit. This role is somehow diminished though, because they rarely withhold their support and their interests can therefore not be considered urgent. UK is the most well-developed country in open data, which can be seen from the rankings in Open Data Barometer (Davies, 2013) and Open Data Index. Heimstädt, et al (2014) has conducted a timeline analysis of the open data ecosystem development in UK. The results have concluded that the last 15 years have “shaped the UK’s Open Data environment into an Open Data ecosystem”. Clear signs have been identified as the features in a digital ecosystem: independent actors as data suppliers, intermediaries and consumers have been contributing to the ecosystem driven by demand. However, the ecosystem is still far from mature and sustainable in that the demand in the ecosystem is not yet “fully encouraging supply” and actors “have yet to experience entirely mutual interdependence”.